CPS Camp No. 59, a General Land Office base camp in a former Civilian Conservation Corps camp near Elkton, Oregon operated by the American Friends Service Committee (AFSC), opened in November 1942 and closed in February 1946. The men fought forest fires, performed fire prevention and land preservation duties. CPS Camp No. 59 was located in Douglas County near Elkton, Oregon some thirty-six miles from the Pacific Ocean and about sixty miles southwest of Eugene, Oregon. 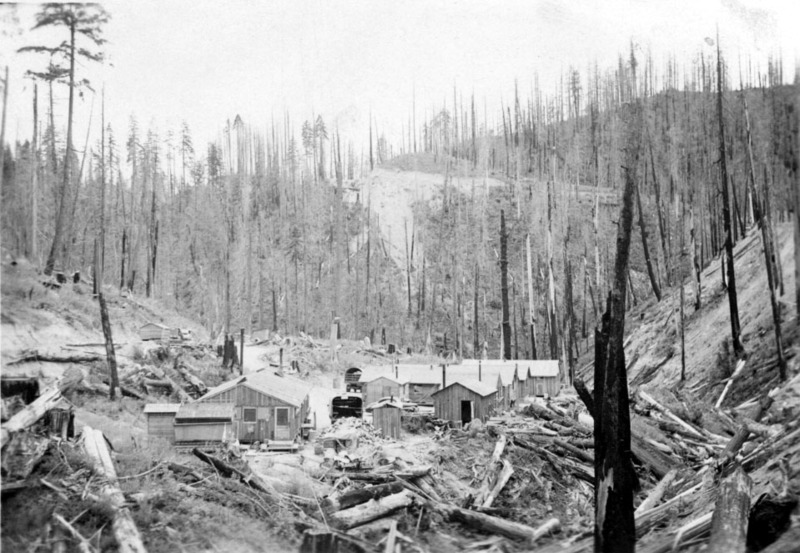 The former CCC camp rested on a plateau above the town and the Umpqua River. In the first year, two hundred and twenty men served at Elkton for some period of time; but with transfers in and out, enrollment settled at one hundred and fifty men. The initial group came from Coleville, California soon followed by thirty-eight men from Coshocton in Ohio. Some transferred into the camp from CPS Camp No. 3, Patapsco and CPS Camp No. 52, Powellville, both in Maryland. Others transferred from additional eastern camps. In late 1944, some men transferred in from CPS Camp No. 46 in Big Flats, New York. The men transferring from Powellville and Big Flats included veteran protesters. At the conclusion of the first year, a number had transferred out, including six men to the government camp at Mancos, three men changed their draft status to 1A, five men chose noncombatant work in the armed services, and one left CPS for prison (The Scrivener, Vol. II:3). Elkton men entered CPS from nineteen different states. On average, the men were 25.4 years of age, thirteen of them married, one with children. The men at Elkton came to the camp having completed an average of 14.2 years of schooling. Twenty men held college degrees and six reported graduate work. Men in Friends camps tended to report diversity in religious affiliation, including men with no affiliation at all. The largest group of Elkton men reported Methodist affiliation, followed by Friends and then unaffiliated. When drafted, 26.1 percent of the men were students; 17.4 percent worked in agriculture or related areas; 16.3 percent worked in education, social service or other civic areas; 14.1 percent worked in mechanical areas; 9.6 percent held commercial jobs; 6.5 percent performed miscellaneous work; 4.3 percent held scientific positions; and 3.3 percent worked in aesthetic professions of music, news and photography (Tap Root Vol. I:1 pp. 4-5). 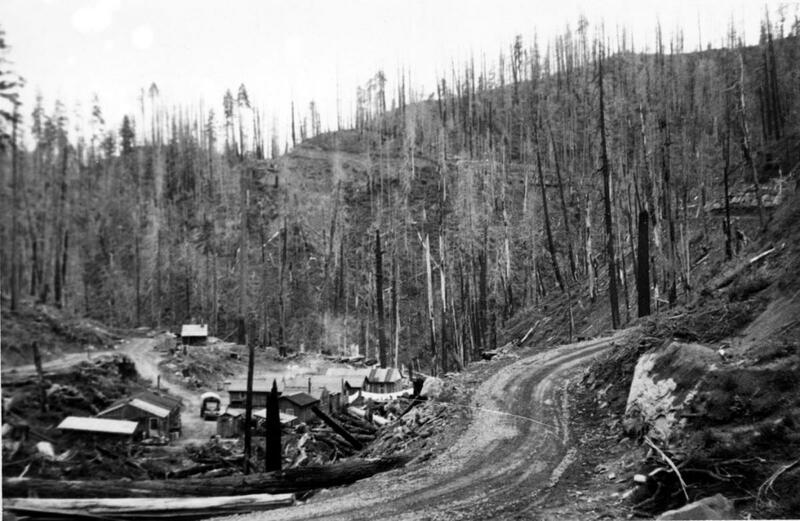 The men fought forest fires (nine in the first year), engaged in fire prevention that included cone-picking, as well as building truck and horse trails, timber cruising, planting trees, building and maintaining equipment. They also constructed fire lookout towers and fire guard stations. Eighteen men maintained the camp. They performed technical service, staffed the office and kept camp records, prepared meals, and heated the camp. Men worked in side camps including Big Creek, Drain, and McKinley. At McKinley, one hundred miles south of Elkton, men tore down a CCC camp and erected a building more suitable for the permanent nursery crew nearer to their work. The crew weeded and planted seedlings in constructed seed beds in the McKinley Spike Camp nursery. When the seedlings matured, the men pulled young trees for planting. They conducted a Federal Land Survey of public land including cataloging regulations governing the land. Two men mapped for blister rust control and four others made maps for the conservation lands. Some prepared signs and posters while others conducted research and studies in logging recovery and other phases of forestry. A canning crew preserved tomatoes, prunes and salmon, putting up 6,517 quarts and saving about $800 for the camp during the first year. Several men planted three acres that supplied food for the camp. The men renovated one dorm into an auditorium, furnishing it with artwork and curtains. After a fire destroyed the officers and forestry quarters at McKinley, the men reconstructed and repaired the damage. In the earlier years, the men created regular variety shows in the auditorium, offered a film series of two full length films per month for which the men contributed fifty cents monthly, and hosted regular speakers and guests covering a variety of topics. The men made good use of the camp library, wood-working shop, small classrooms, dark rooms, recreation hall and mechanical shops. In order to accommodate the diverse religious interests, the men decided to hold two worship periods a week, the morning one devoted to silent worship where spoken messages could emerge, and an evening worship with Bible study or readings from the mystics and a song, each followed by a period of silence. The men reported good public relations with townspeople. At one open house, nearly one third of the town of Elkton (population one hundred and fifty) visited the camp. The high school basketball team longed for contests with other teams, but with gasoline rationing, travel was limited. The camp men suffered defeat on several occasions. Three local churches offered hearty welcomes to “the Conchies”—Methodist, Church of Christ, and Assembly of God. John Meneyes assisted a local Forest Rangers Club of eight local boys ranging in age from nine to fourteen. They hiked and studied first aid. The men published three issues of a camp paper Newsletter in November 1942. The men published twenty-six issues of Project News from November 1942 through November 1944. A Selective Service official declared the camp one of “the best in the system” in early 1945, noting in particular the camp democracy, camper work initiative, as well as positive relationships with agency supervisors. Shortly thereafter, disillusion with the CPS system increased as evidenced in camp publication reports of conflicts over work requirements. The fall 1945 camp educational program included visits from Ferner Nuhn, Iowa poet and frequent CPS visitor, talking of the future; Dr. Leona Tyler from the University of Oregon interviewed men interested in vocational testing and counseling; and the men attended the Waldport production of George Bernard Shaw’s Candida. The September 2, 1945 Elkton Newsletter announced that the camp educational program did not fully recover “from the staggering blows of the fire season. . .daily devotions are a casualty”. (p. 2) It also reported that nurse Phyllis McEvers left the camp. Six weeks later, Robert Leeper, professor of psychology spoke in the ongoing psychiatry seminar and A.J. Muste of the Fellowship of Reconciliation visited. (Elkton Newsletter, October 17, 1945) The men produced Elkton Newsletter from June through December of 1945. The men published a number of papers and journals. Quest, a literary journal initiated on May 8, 1944 stated as its purpose. . .
By the time the work was published, Bloomstein had left the camp for a detached service malaria experiment in Massachusetts. Fifteen men contributed the nine articles or served on the staff of this single journal. The men had published an earlier literary journal The Scrivener, from June 1943 through February 1944. The men published Tap Root from February through May 1943. Elkton Potpourri appeared August 9, 1944, edited by Americo Chiarito, (a contributor to Quest), its purpose to encourage contributions of any type (not just literary work) from men within Elkton and with the side camps that would “stir up good discussions”. He included a reprint of a critique of CPS by Gerald F. Dingman from CPS G-I published at CPS Camp No. 111 at Mancos, Colorado. However, by then Dingman had been transferred to Germfask in Michigan, regularly referred to as a prison camp. Potpourri continued through January-February 1945. Beginning July 1, 1945, the men published The Rebel Clarion, (July through December 1945), which originated in the side camp at McKinley. . . The opening issue featured work conflict at McKinley and “Bitterness in CPS” acknowledging that “the majority of us are becoming disillusioned with conditions”. Vol. 1 No. 4 of Rebel Clarion, in a front page article “Elkton to Close by December 15”, reported on . . .
the rapid descent of morale blamed on the heavy handedness of Selective Service, AFSC, and the camp “Old Guard” when dissent first began. a book review “What is a Rebel” by George R. New on Hendrick Van Loon’s book Tolerance. A sizable group of men in the camp openly declared their desire to see the AFSC camps fail, and in 1945 some men refused work, claimed to be sick but refused any prescribed medical treatment. Americo Chiarito brought matters to a head with his refusal to work but to stay at Elkton to persuade others to join in his resistance of “involuntary servitude”. AFSC asked for his transfer to a government camp; campers responded by electing Chiarito to AFSC’s C.P.S. Committee of camp representatives. AFSC refused to seat him on the committee. Ultimately he was arrested, and six of his followers refused to work either on project or overhead. The actions disrupted the administration of CPS Camp No. 59, and AFSC decided to close the camp in February 1945 as it was no longer possible to fulfill the camp purposes. For an in depth history of conscientious objection in the United States, see Mulford Q. Sibley and Philip E. Jacob, Conscription of Conscience: The American State and the Conscientious Objector, 1940-1947. Ithaca, NY: Cornell University Press, 1952. Chapter XII The Protests of Conscience pp. 257-278. CPS Camp No. 59 publications The Scrivener and Tap Root in the Swarthmore College Peace Collection, American Friends Service Committee: Civilian Public Service Records (DG002), Section 3, Box 14. CPS Camp No. 59 publications Elkton Newsletter, Elkton Potpourri, Melvonian, Newsletter, Project News, Quest, Rebel Clarion in the Swarthmore College Peace Collection, American Friends Service Committee: Civilian Public Service Records (DG002), Section 3, Box 13.